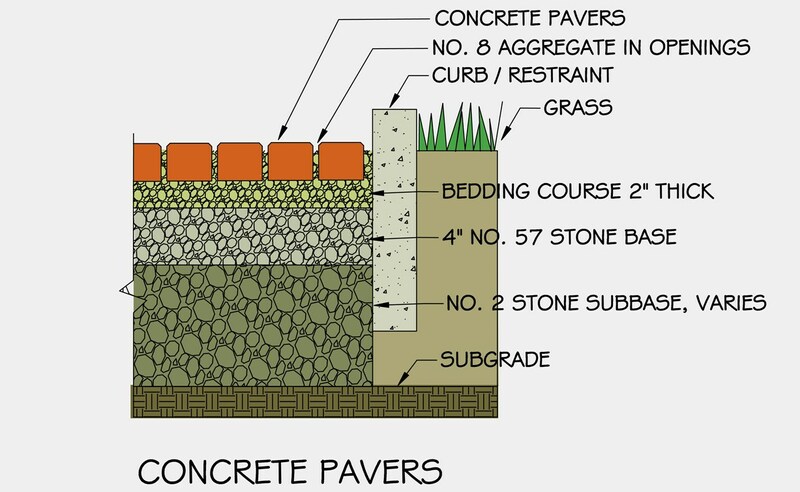 Permeable Pavers is a term that is used that I found a bit misleading. The concrete pavers themselves are NOT permeable. It is the system that the pavers are installed in that create a permeable surface. Permeable surfaces are becoming more important as water issues such as storm water run-off and water recharge areas are being identified as environmental issues. Poor management of storm water and water recharge areas have many implications that effect our ecosystems and drinking water. Impervious surfaces like roadways, sidewalks, and driveways don’t allow water to seep back in the ground and the water is often contaminated with toxins. This water is usually directed to a storm drain that dumps directly into natural water ways like rivers or coastal sites. This contaminated water kills off vegetation and changes the pH creating a detrimental situation. We rely so much on our water for not only drinking and crop irrigation, but for recreation. Permeable paver systems allow water to seep down in between the pavers keeping the water on site. As it seeps through the ground most of the toxins are remediated by the soils and microbes. This allows the water to get to recharge areas that are so vital for drinking water. Concrete pavers have come a long way in recent years and can make very attractive permeable driveways and they are being used in large commercial and municipal parking areas. It is easy to research from small residential to large city projects.